Don’t you hate it when someone tells you that you don’t know diddly squat, don’t know jack? Does it make you more determined than ever to succeed? Do you not tell anyone and continue building your dream in secret? Are those dreams ever as big as building a castle? 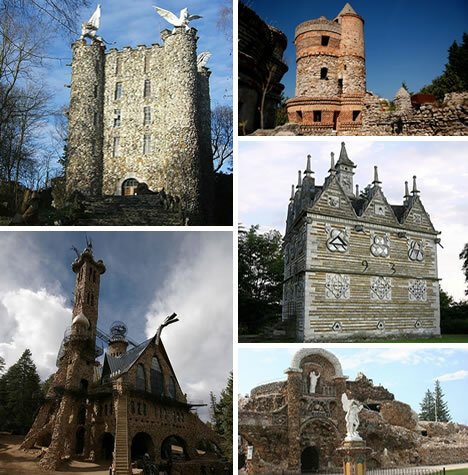 Each of these 14 castles were constructed primarily as the DIY work of one man, except for perhaps a few family members or friends who also didn’t know jack but pitched in. Sometimes not knowing jack comes back to bite us, while sometimes the drive and desire to attain the dream is aided by not knowing how impossible the DIY task should be. 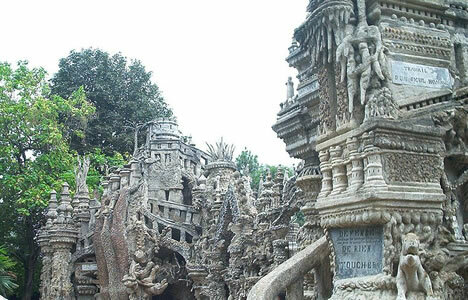 Here are 14 fabulous DIY castles built by people who did not have a clue about construction, who did not know jack about building castles. Bishop Castle is proof of the power of suggestion. 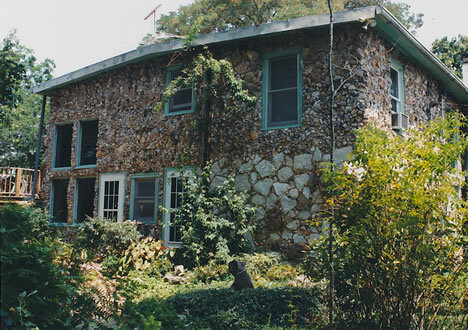 Jim Bishop might not have known jack about building, but he knew enough to construct his family cottage and to cover it with rocks. In 1969, neighbors remarked that the cottage looked similar to a castle. 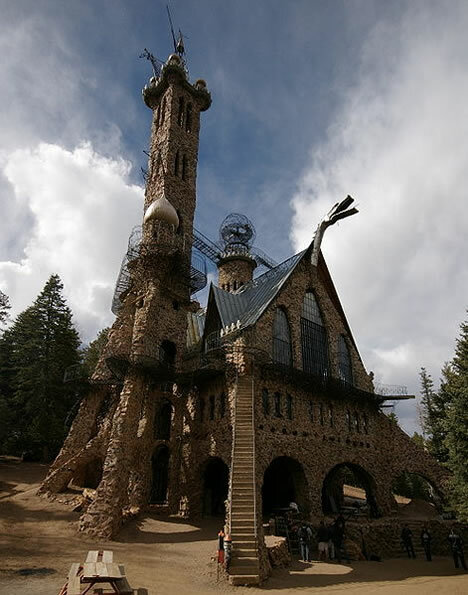 Upon hearing that, Bishop acted as sole builder and constructed Bishop Castle near Rye, Colorado. It has several towers, but the main tower is over 160 feet tall. 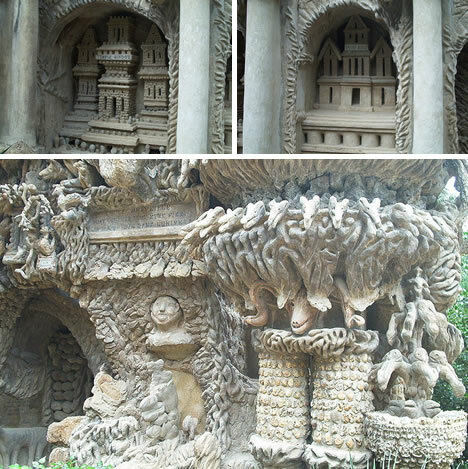 Although some people may say Ferdinand Cheval didn’t know jack, he knew enough to be inspired by one beautiful stone in the road and then to build the castle of his childhood imagination. By day, Cheval worked as a mailman. By night, he worked in secret to construct Palais Ideal. Palais Ideal, the Ideal Palace, “Started in 1879 and finished in 1912; it took over 10,000 days, 93,000 hours, and 33 years of toil.” Cheval wished to be buried there, but French authorities more or less said Cheval didn’t know jack about the law and refused. Cheval spent the next eight years building a magnificent mausoleum in the cemetery of Hauterives. He lived one more year before he was buried there at the age of 80. 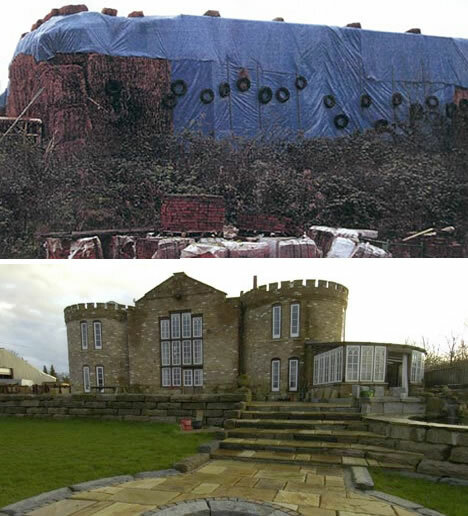 If you had neither the training nor the lawful building permits, how do you hide a self built castle for four years? Behind 40 feet tall bales of hay. 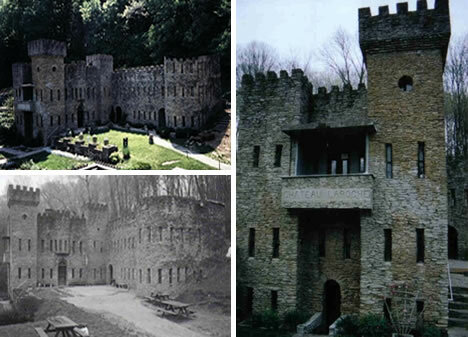 Robert Fidler and his wife built their dream castle, complete with ramparts and cannons. After four years, thinking the time for objections had passed, they removed stacked hay and tada! Fidler’s Castle. Neighbors and the Redhill Surrey planning council were not impressed. In fact, after years in court, Fidler lost the battle. His dream of a castle was jacked and it is to be knocked down. 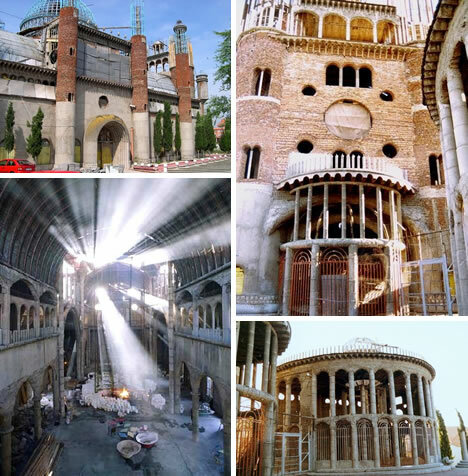 No money, no formal training, but rich with faith, former monk, farmer and bull fighter, Justo Gallego Martínez built his very own Cathedral near Madrid, Spain. People make promises when they are close to death, but few follow up on them and build a “castle.” When he was struck down with tuberculosis, Martínez promised he would build a shrine in honor of the Lady of the Pillar if he recovered. 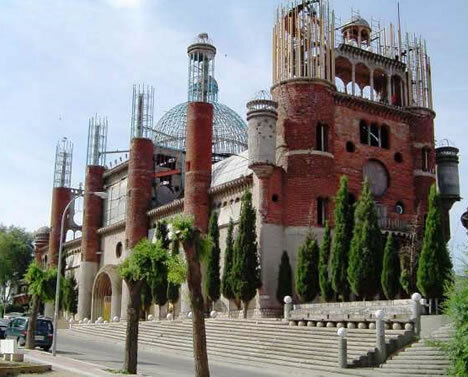 The Cathedral, his castle, has no formal plans and is still under construction. He works mainly alone and it might take him another 15 – 20 years to complete. Most of the structure was built from recycled materials like the columns which were molded with old petrol drums. The domed cathedral stands over 131 feet. Pretty impressive for someone who doesn’t know jack about building. 15 years in prison might cause anyone to go a little crazy, but how many might it inspire to build their own castle? 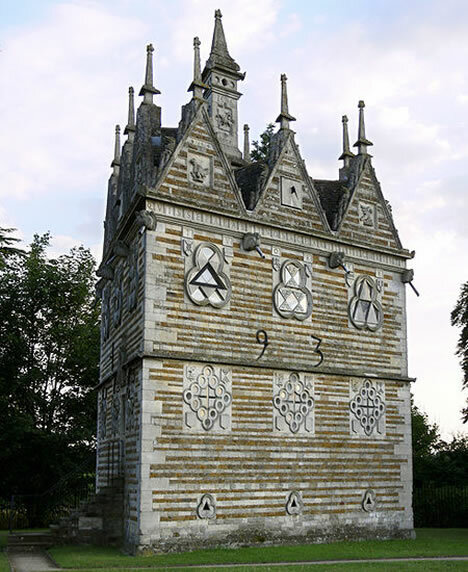 Upon his release of prison in 1593, Sir Thomas Tresham designed and constructed his castle, the Triangular Lodge. 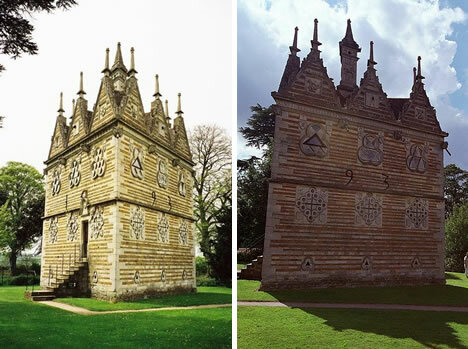 He was jailed for refusing to convert from Catholic to Protestant, so Tresham built Triangular Lodge to reflect the Holy Trinity. It has three walls, each of which are 33 feet long. Each wall has three triangular windows and surmounted by three gargoyles. The structure is three stories high and has a triangular chimney. The three outside walls have three Latin texts, each 33 letters long. After being diagnosis with tuberculosis, but telling no one about it, Boyce Luther Gulley abandoned his life and family. 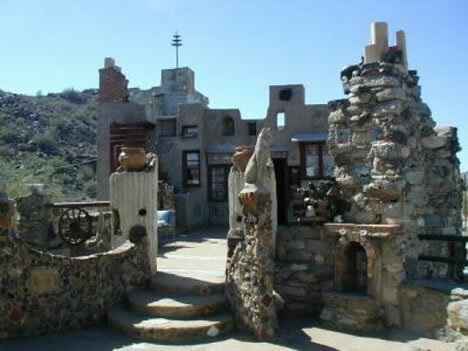 He moved outside of Phoenix, Arizona, and started building Mystery Castle. 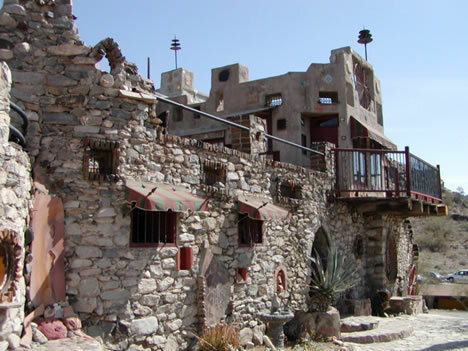 The self built castle took 15 years, has 18 rooms, 13 fireplaces, and was constructed of reclaimed materials like car parts, stones, salvaged rail tracks, telephone poles, and adobe. It’s held together with mortar made from goats milk and cement. Upon his death, his daughter, also his princess, learned she now was the owner of Mystery Castle. Perhaps her husband told her that she didn’t know jack, but whatever set her off, Mrs. Quigley found one very unique way to get her own castle. 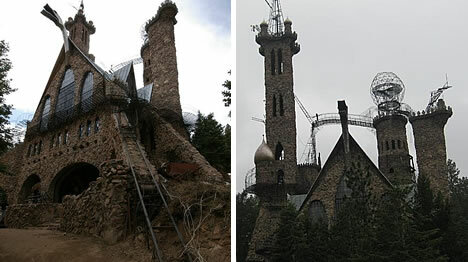 While her husband was away, she demolished their house so he would help her build Quigley’s Castle. 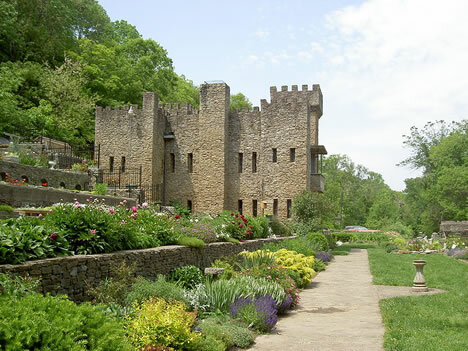 It is located in Eureka Springs, Arkansas. 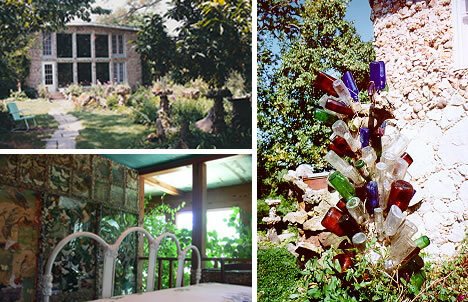 Mrs. Quigley’s rock and bottle sculptures fill the indoors and cover the castle’s facade. Inside one of the bedrooms, there is a wall of butterflies next to trees growing indoors. 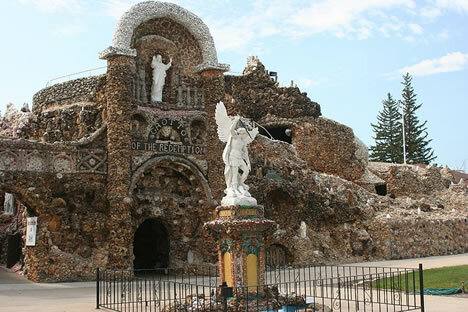 The Grotto of the Redemption is a self constructed “castle” built upon a promise. Father Paul Dobberstein became critically ill with pneumonia and promised to build a shrine to the Virgin Mary if she interceded for him. After he recovered, Dobberstein started building the religious monument located in West Bend, Iowa. 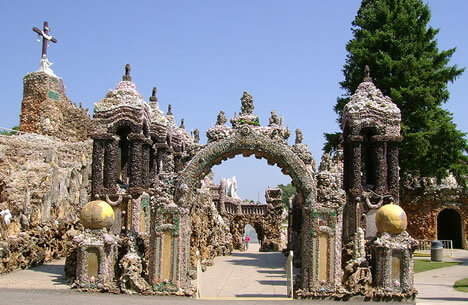 The Grotto is actually a conglomeration of minerals, fossils, shells, and petrifactions. They are built into nine grottos depicting scenes from the life of Jesus. It is believed to be the largest grotto in the world. Dobberstein might not have known jack, but he knew Jesus. The Wood family took a 4-story brick tenement building in Brooklyn, New York, and improvised construction to build their castle. 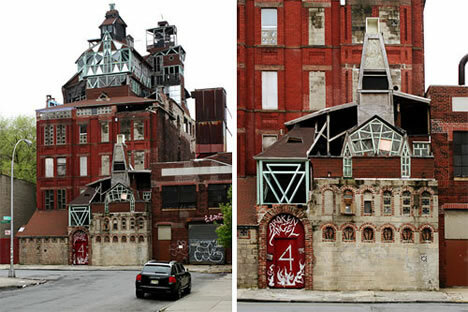 Broken Angel house is a castle of broken dreams and broken hearts. For 27 years, Arthur and Cynthia Wood built the structure up until it reached about 9 stories above the sidewalk. A fire broke out in 2006, inside the huge cathedral of beautiful arches and stained glass windows. The Wood family was ordered to vacate, but Arthur defied the order and was arrested. Cynthia was arrested while outside with their dog. Arthur, his wife and their pets lived in a car outside their own castle during the cold winter months that followed. 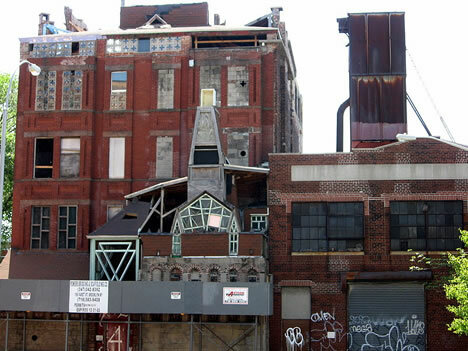 Faced with foreclosure and medical bills from Cynthia’s cancer, the plans to renovate Broken Angel were never realized. This tragic tale of broken dreams gets worse; Cynthia died of cancer and Arthur has a broken heart, but not his Broken Angel castle. 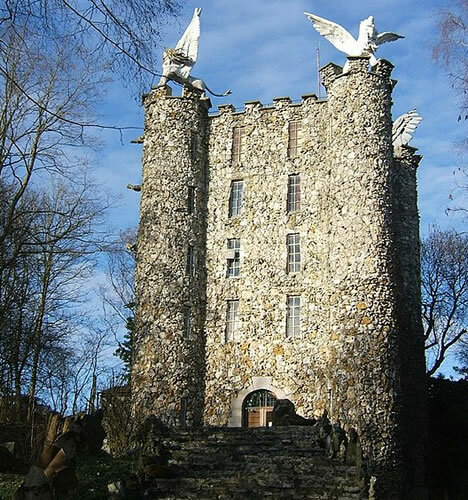 This castle in Liege, Belgium, was built by Robert Garcet. 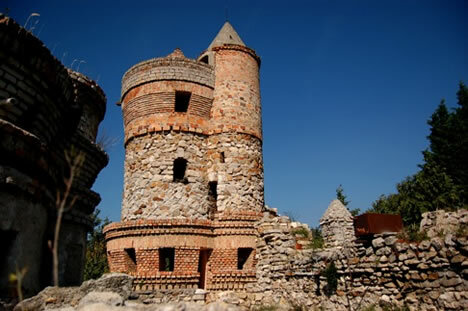 The tower-museum is called the Tower of Eben-Ezer. It has seven floors and stands 108 feet high. The four turrets at the corners are topped with magnificent statues. In the Bible, Eben-Ezer is the stone of help, so Garcet chose to top his castle with the four cherubs of the Apocalypse: Taurus, north-west, Man, south-west, the Lion, south-east, and Eagle, the northeast. Garcet might not have known diddly about constructing a castle, but the stone cutter knew enough to enlist help from other visionary friends. Stephen Tarodi, with the help of his family who also did not know jack about building, toiled since the 1950s to build Tarodi Var. 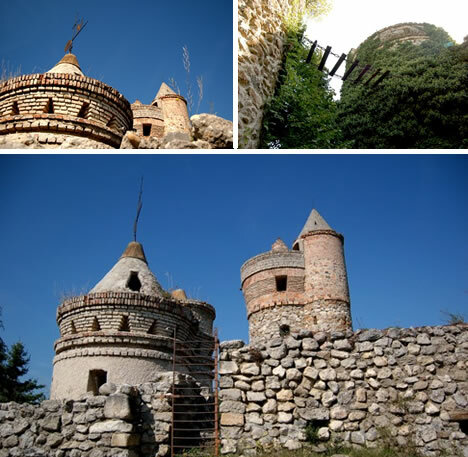 The castle in Sopron, Hungary, is complete with towers, turrets, rope bridges and arches. Mr. Tarodi died in 2009, but his sons will continue his legacy. Part of Tarodi Var is open to the public. The castle is filled with antique furniture and paintings. 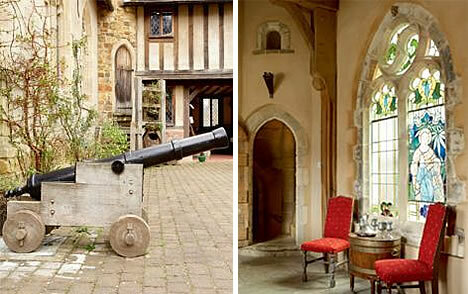 Braylsham Castle in East Sussex was a DIY labor of love built by orthodontist and physiotherapist John Mew. 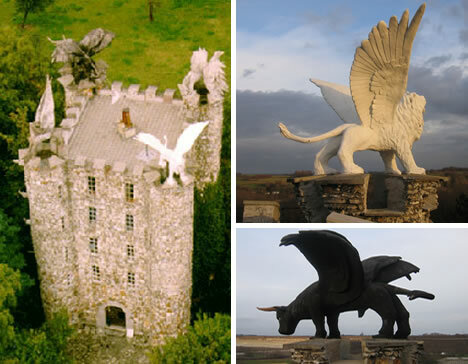 It took John and his wife Jo Mew eight years of backbreaking work to construct this castle from scratch. Both of Braylsham Castle’s towers are faced in reclaimed stone. The round tower leads down to the dungeon (basement), but that is not where their innovation ended. 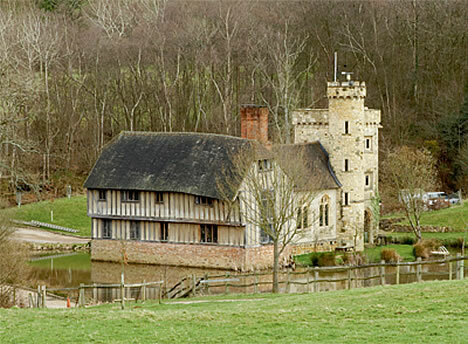 Braylsham Castle and the medieval manor house stand on an island which was also created by the Mews. Their castle comes complete with a moat. Not bad for a man who didn’t know jack about building a castle. One gangster’s self built castle is another man’s fire hazard. 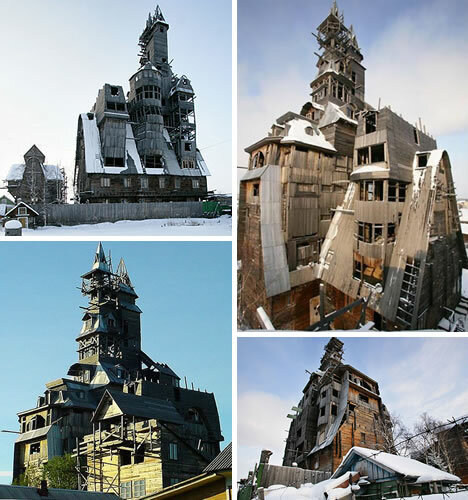 Nikolai Sutyagin spent 15 years of his life constructing his 13-story, 144-foot-tall, wooden “castle.” The house which he considered his castle, which he didn’t know diddly squat about building, was considered an eyesore and glorified barn by many of his neighbors. 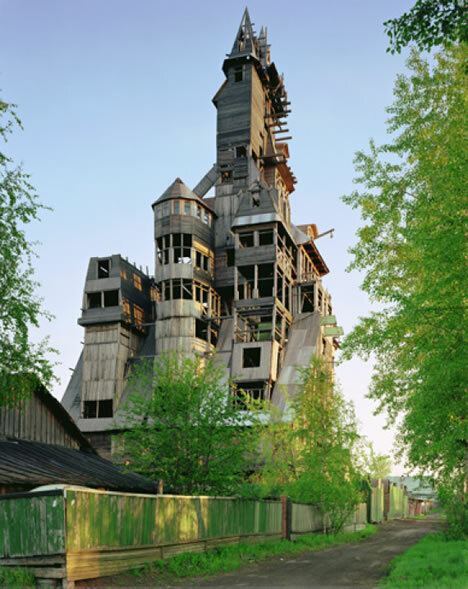 Sutyagin House was reported to be Russia’s tallest wooden house, perhaps the tallest in the world. While Sutyagin was in prison for racketeering charges, the city jacked him up. His castle had deteriorated to the point of being condemned. Sutyagin house was demolished.